Another wedding invitation that I drew last summer. In this one I drew the groom in a suit and tie, carrying the bride in his arms. The bride is in an elegant white wedding dress and holding a glass of sizzling champagne. This couple used the caricature for their wedding invites, “save the date” magnets, and also printed T-shirts for their friends to wear on their wedding day. 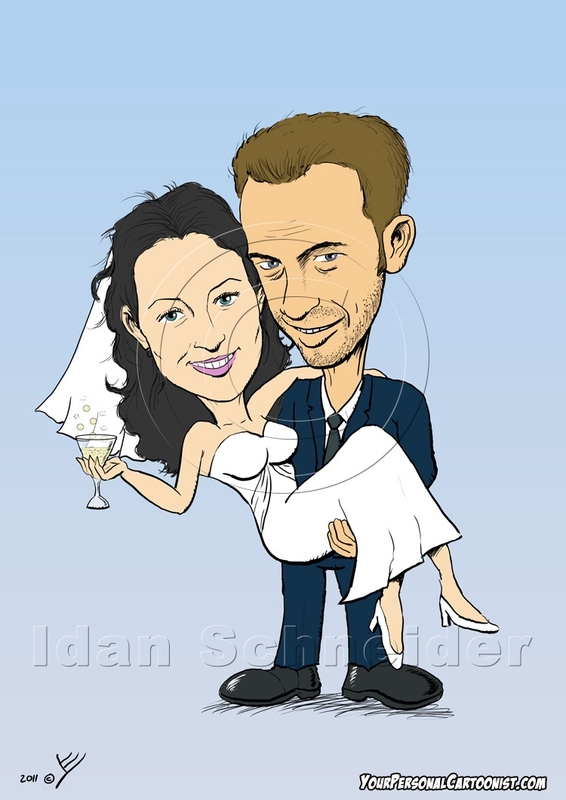 Do you like this wedding invite caricature? I’ll draw your caricature for your wedding invite, in the same style, in a pose of your choice. Click here for more information. This entry was posted in Uncategorized and tagged Caricatures, Wedding Invitations by Idan. Bookmark the permalink.